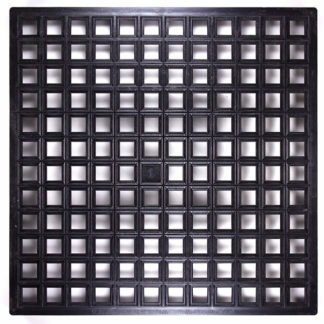 The Diamond Grit File is tool steel impregnated with diamond grit and can be used to smooth shape a variety of hard materials including metal, glass, and porcelain. The blade is 4.75 inches long by 0.625 inches wide. The overall tool length (including the handle is about 9.25 inches. An ordinary Marble File or a Rubbing Stone can be used to smooth the jagged edges that are sometimes left after an imperfect cut. BUT, if you are working with really hard porcelain, such as some varieties of broken dinnerware, then this tool can reduce the amount of time and labor required. Broken tile is dangerous not only because it can be razor sharp but also because it is often located on the corner or edge of a surface, just in the right location for people to brush against and cut themselves. 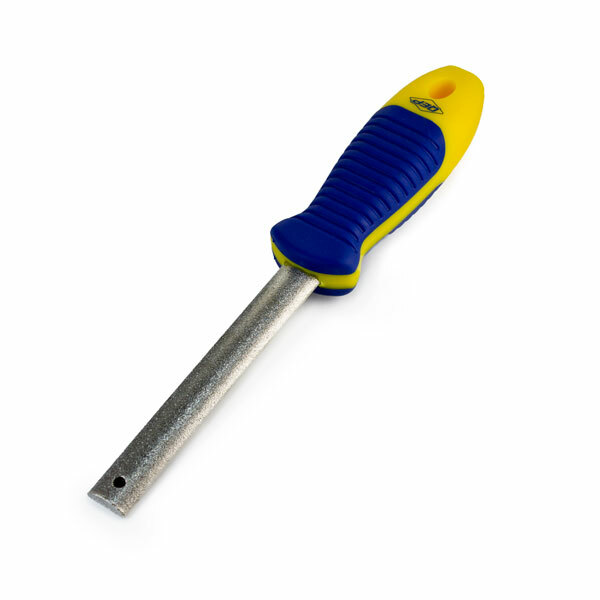 The Diamond Grit File is particularly useful for this task because it is easier to make a smooth finished edge with it than it is with a regular Marble File. It is also better than the regular Marble File at not chipping up flakes of material because the diamond grit is very fine. Avoid breathing construction dusts of any type, especially glass, cement, ceramics, stone, etc. An ordinary dust mask rated N95 is recommended as a precaution when using the file, but we prefer to contain the dust with mist at the source. Keeping the dust wet is an easy was to make sure it stays out of the air. Dispose of the wet dust as solid waste in a trash bag and not down your drains. We lean the file inside a 2-gallon bucket and mist with water from a spray bottle. The bucket collects the waste and acts as a moisture reservoir for keeping the air around the file humid, which causes dust to fall out of the air faster. Note that misting causes the file to rust and shortens the life of the tool, but files are more easily replaced than lungs, especially when you work with construction materials everyday. Always wear safety glasses with side shields when using the file. Make sure that you don’t file tile around people not wearing safety glasses. Flying chips could potentially hit their eyes as easily as yours. Be aware that cutting and filing tile can produce tiny slivers that are surprisingly sharp. Never sweep off a work surface with your bare hand. This is how most cuts happen in the studio (seriously). Use a vacuum or counter brush instead.